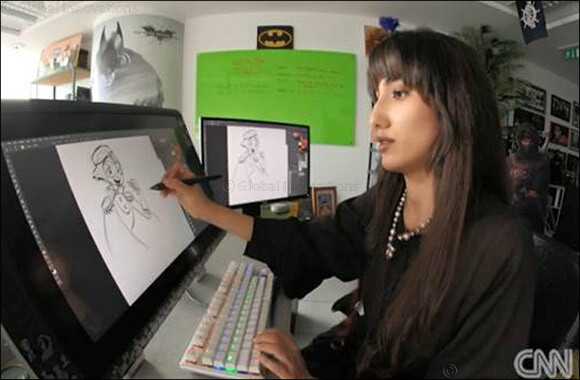 “The world is thirsty for an Arab superhero"
Dubai, UAE, August 06, 2018: CNN’s Inside the Middle East meets a group of young, like-minded people who have a passion for comic books and have come together to establish a pop culture community. Brought up on seeing western superheroes, these comic book fans crave an Arab superhero. Fatma decided to create her own Arab superhero that accurately reflects the culture of the UAE: “I recently created a super cool, superhero cartoon called Emara which is about a young Emirati superhero fighting crimes in the busy, bustling streets of the UAE. Emara is the superhero I wanted growing up that I didn't get to have. What I made sure to give Emara is that there are little bits and pieces of how life is here and it's chill. It's not how they think it is which is, ‘Oh, you know, everybody has to be in a niqab. You're not allowed to leave your house. You can't drive.’ Which isn't the case in the UAE. You can base a lot of things around the culture. Like what I did with Emara and I dressed her up. I wanted Emara to dress modestly because I think that specific character, especially as a main character, is missing. There are no hijabi main characters, especially not in a superhero cartoon or comic or whatever. At least nothing I've seen before, so I really wanted to include that.